• A group of Imperial Stormtroopers hotly pursues Han Solo, Luke Skywalker, Princess Leia and Chewbacca, who are attempting to return the Millennium Falcon. Though they strike with speed and accuracy, the Stormtroopers are too late to capture the Rebels aboard the Imperial space station. 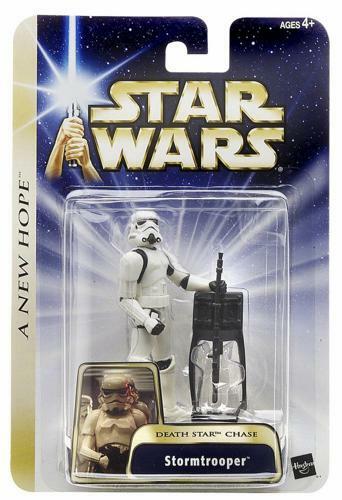 • Action figure comes with blaster rifle and blaster rifle rack. © 2004 Lucasfilm Ltd. & ® or ™ where indicated. All rights reserved. Used under authorization. ®* and/or ™* & © 2004 Hasbro. All Rights Reserved."